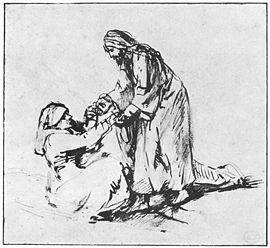 Jesus heals Peter's mother-in-law (by Rembrandt). The Social Gospel emphasized the serving and healing ministry of Jesus as a model for the church's mission in the world. The Social Gospel is a Protestant Christian theological teaching that formed the basis for a prominent social movement in the late nineteenth and early twentieth centuries. It remains influential today. The Social Gospel emphasizes living Jesus' teaching to "love one's neighbor" rather than living only by faith in the doctrines and sacraments of the Christian religion. The foremost writer among proponents was the American Walter Rauschenbusch, together with reformers such as Richard T. Ely and Washington Gladden. The Social Gospel became a major force in the mainline churches of Great Britain and the United States, inspiring movements as diverse as the YMCA, Women's suffrage, socialist labor reform, and Prohibition. The Social Gospel movement applied Christian ethics to social problems such as poverty, liquor, racial equality, slums, public hygiene, child labor, education, war, women's issues, and workers' rights. Above all it opposed rampant individualism and called for the practice of religion to be socially aware. It contributed to the establishment of the modern welfare state in Europe and has been criticized for its tendency to lead to socialistic government policies and the abandonment of the churches' traditional responsibility as primary agencies of public charity. The movement faded during World War II, but many of its ideas reappeared in the Civil Rights Movement of the 1960s. Social Gospel principles continue to inspire newer movements in both mainline and black churches, as well as to blend with more radical trends such as liberation theology, black theology, feminist theology, and gay theology. In Britain, several leading members of the British Labour Party are avowed adherents of the Social Gospel. In the late nineteenth century, many Europeans and Americans had grown deeply troubled by the poverty level and the low quality of living in the urban slums. Meanwhile, liberal Christian theologians such as Albrecht Ritschl and Adolf von Harnack had brought a new vision of the Gospel message which emphasized practicing Jesus' teaching of loving one's neighbor more than faith in the traditional doctrines of the church. In England, Charles Kingsley and Frederick Denison Maurice launched movements inspired by the idea of Christian Socialism, while similar movements also began in Switzerland and Germany. In the United States, Reverend Charles Sheldon coined the phrase "What Would Jesus Do?" to emphasize the lifestyle and teaching of Jesus over mere faith, and later popularized his vision of Christian ethics in the novel In His Steps. 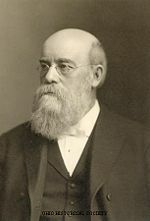 Sheldon's work helped to inspire the Social Gospel movement, especially in the writings of Washington Gladden and Walter Rauschenbusch. Rauschenbusch urged Christians to replace selfishness with love as the basis of human society. The mission of the church, he taught, is not merely to get individuals into heaven, but bring about real change in society on earth. 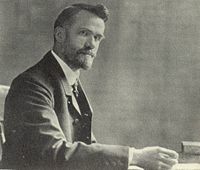 In his Christianity and the Social Crisis (1907), Rauschenbusch argued that Jesus never let his life of faith distract him from the task of serving others and reforming society, and neither should his followers. The mission of the church is thus not only to preach individual salvation but to effect social justice and healing. Washington Gladden, another major leader of the Social Gospel movement, was a Congregational pastor and leading member of the Progressive Movement. Gladden won fame by campaigning against the Boss Tweed organization as editor of the New York Independent. He was also one of the first major United States religious figures to support unionization and was an early opponent of racial segregation. Economist Richard Ely, meanwhile, championed Christian socialism in America, believing church and state should work together harmoniously to establish a just social order. He advocated the prohibition of child labor, public control of natural resources, and a unionized work force. In the optimistic days before WWI, the Social Gospel movement found fertile ground in mainline American churches, providing a religious rationale for action to address social concerns from poverty to women's suffrage. Activists in the movement further hoped that by enacting public health measures and supporting enforced schooling for the poor they could facilitate the development of the talents and skills of the masses and improve the quality of their moral lives as well. In 1908, the Federal Council of Churches(FCC) was established in the United States as an institutional vehicle through which mainline churches cooperated in the furtherance of programs and policies based on the Social Gospel, as well as other ecumenical activities. In 1950 the FCC merged with the International Council of Religious Education to form the National Council of Churches, which is still active today with headquarters in New York City. 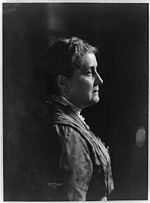 Jane Addams. The work of Hull House typified the Social Gospel's concern for helping social outcasts like the poor, unemployed, and even child prostitutes. In Europe, liberal Christian theologians influenced Kaiser Wilhelm to adopt social programs that laid the foundations for the modern welfare state. This development is credited by some economists with gradually improving the conditions working class in the Western world and heading off socialist revolution predicted by Karl Marx and his followers. On the other hand, the support of German and other European Christian intellectuals for Wilhelm's war policy dealt a major blow to liberal Christianity in general and the Social Gospel in particular, leading to the emergence of the Neo-Orthodoxy Karl Barth as a viable intellectual alternative. 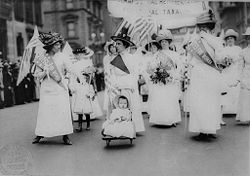 Another important concern of the Social Gospel movement was labor reform, such as abolishing child labor and regulating the hours of work by mothers. In 1920 the movement launched a crusade against the 12-hour day for men at U.S. Steel. The Social Gospel also inspired Christians to speak out against the lynchings of blacks, both in the South and rural northern states. Reformers inspired by the Social Gospel also opened settlement houses to help the poor and immigrants improve their lives. These institutions offered services such as daycare, education, and health care to needy people in slum neighborhoods. The most notable of them was Hull House in Chicago, operated by Jane Addams. The YMCA, originally created to help rural youth adjust to the city without losing their religion, became a powerful instrument of the Social Gospel throughout the world. Nearly all the denominations, including Catholics, engaged in foreign missions which often had a Social Gospel component, especially in terms of medical and food services. Christians were reminded of the teaching of Jesus in Matthew 25, that feeding the hungry, clothing the naked, and caring for the sick were signs of a true Christian. So pervasive was the Social Gospel's influence that both Theodore Roosevelt and Woodrow Wilson in the United States, as well as David Lloyd George in England, sought Rauschenbusch's counsel. The Black denominations, especially the African Methodist Episcopal (AME) and the African Methodist Episcopal Zion (AMEZ) denominations, had active programs in support of the Social Gospel vision. Many elements of the mainline churches, both evangelical ("pietistic") and liturgical ("high church"), supported the Social Gospel. Among evangelical churches the Social Gospel often translated into promoting Prohibition, which was viewed as an effort to better society by eliminating the social ills of alcohol abuse. In the United States, it was the Social Gospel that inspired the religious wing of the progressive movement, which had the aim of combating injustice, suffering, and poverty in society through socialist political reforms. During the New Deal of the 1930s, Social Gospel themes could be seen in the work of Harry Hopkins, Will Alexander, and Mary McLeod Bethune, who added a new concern by championing the rights of African Americans. After 1940, the horrors of World War II badly damaged the optimism of the Social Gospel and liberal Christianity in general. The Social Gospel movement soon faded as a major force in American politics. However, it had developed deep roots in the African American community and was invigorated in the 1950s by black leaders like Baptist minister Martin Luther King, Jr. and mainline churchmen of the civil rights movement. 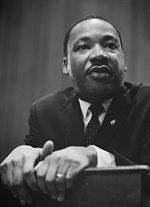 Perhaps the most famous speech emphasizing Social Gospel themes was King's "I Have a Dream" speech. In Britain, the Social Gospel remains influential among Christian socialist circles in the Church of England, Methodist, and Calvinist movements. The Christian Socialist Movement (CSM) is a Social Gospel-inspired society affiliated to the British Labour Party. It is an amalgamation of the earlier Society of Socialist Clergy and Ministers and the Socialist Christian League. It affiliated to the Labour Party in 1988. At last count the CSM had more than 40 members in the House of Commons and House of Lords, including former prime minister Tony Blair and the current prime minister Gordon Brown. In the United States, the Social Gospel is still influential in mainline Protestant denominations such as the Evangelical Lutheran Church in America, the Presbyterian Church USA, the United Church of Christ, and the United Methodist Church. It is growing in the Episcopal Church as well, especially with that church's effort to support the ONE Campaign, which aims to increase government funding for and effectiveness of international aid programs. In Canada, it is widely present in the United Church and in the Anglican Church. Social Gospel elements can also be found in many service and relief agencies associated with Protestant denominations and the Catholic Church in the United States. In Catholicism, liberation theology uses much of the language of the Social Gospel. In the Anglican and Quaker churches the Social Gospel has often found expression in pacifism. Religiously based movements ranging from gay marriage to human rights campaigns and black theology all have expressed their positions in terms of the Social Gospel. ↑ Jack B. Rogers and Robert E. Blade, "The Great Ends of the Church: Two Perspectives," in Journal of Presbyterian History, 76: 181-186. ↑ Text of MLK Jr.'s "I have a dream" speech Retrieved December 29, 2008. Handy, Robert T. 1966. The Social Gospel in America, 1870–1920: Gladden, Ely, Rauschenbusch. New York: Oxford University Press. All links retrieved October 7, 2015. This page was last modified on 7 October 2015, at 19:29.